“For me it's all about the visual, and I'm comfortable in those spaces I select,” said Silvia Lizama, a professor of photography at Barry University in Miami. She has found most of the locations for her photography by driving around her home and looking for the hidden artistic potential in everyday life. Originally born in Havana, Cuba, Lizama immigrated with her family to South Florida when she was three years old. She became interested in photography while attending college, and after 30 years her award-winning work has gone on to receive international attention. Throughout her distinguished career she has photographed many historic areas like Stonehenge, ancient Roman ruins, temples of South America and many other unique locations. But she feels most comfortable developing pictures of unknown places to create an original image that is uniquely her own. 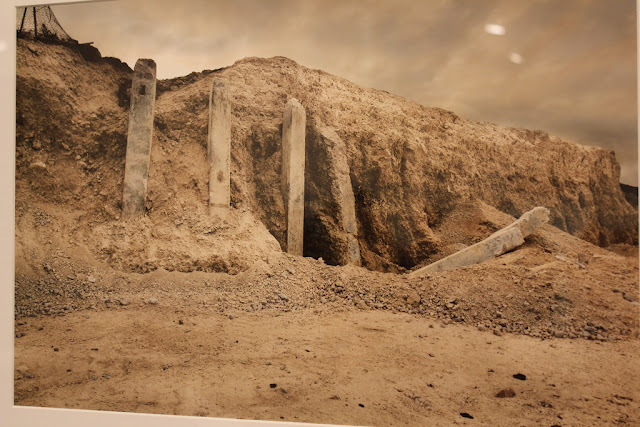 Her newest series displays strikingly barren landscapes of rock, metal and concrete highlighted by a brilliant kaleidoscope of colors. She transforms unexceptional areas into something far richer with her refined hyper-realistic coloring style. Lizama takes a black and white image then manually adds unique colors that look realistic and full of wonder. The technique she has mastered of applying oil-based paints to printed photographs is masterfully transferred to the realm of digital photography. Lizama describes her relationship with digital photography as a love-hate situation and “I'm doing digital because I have to learn it for my students.” She stresses the importance of learning updated techniques, and keeping up with the latest developments in technology in this modern digital age. The ease of use and high output of digital photography are strong beneficial factors favoring the use of digital, but she fears a digital image lacks the personal refinement and beauty of conventionally printed photos developed in a darkroom. To ensure a personal connection Silvia adds a fingerprint next to her signature with every one of the photos. She wants to fight the notion that an artistic photographer just sends an image to a print lab and never sees their work before it's framed. Her acclaim came from photos of the desolate interiors of unfinished buildings with natural light mixed with customized colors. She intentionally leaves people out of the image because the person's look and style may limit the artworks timelessness. The stark and hauntingly beautiful images convey ambiguous emotions that are open to interpenetration. On top of the prolific use of color is the masterful utilization of natural lighting to create an image that looks otherworldly. “I do photography myself, and I love finding inspiration in other peoples work,” said Valencia film student Tomoko Goddard. Lizama walked around construction areas near Valencia College's East Campus where this current exhibition is being displayed, as she gathered more shots for her next exhibition in about a year. She spends about a year working on each new series and feels a drive to continue looking for unique locations for her art. 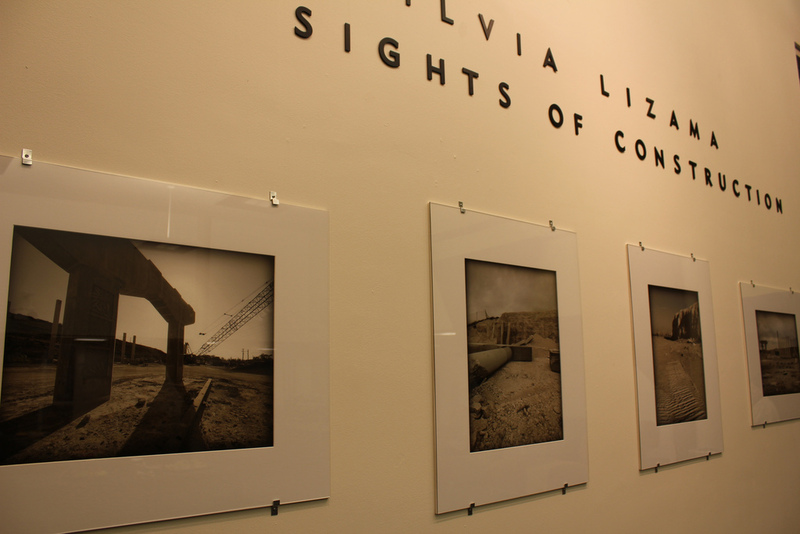 “Sights of Construction” by Silvia Lizama will be on display until Aug. 5 at the Anita S. Wooten Gallery located in Building 3 at Valencia’s East Campus. This free gallery is open from 8 a.m. to 4:30 p.m. Monday through Thursday, and from 8 a.m. to noon on Friday. 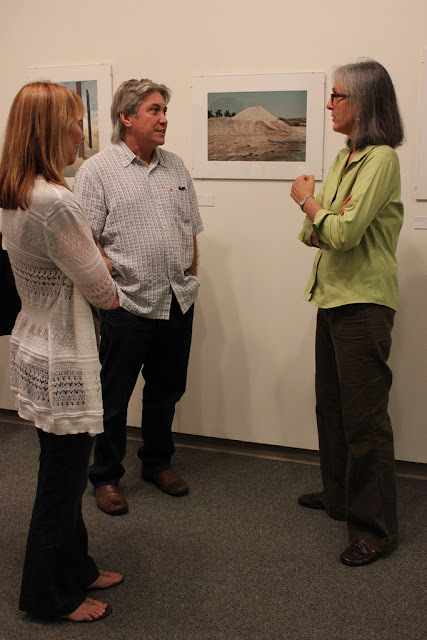 Silvia Lizama (right) with attendees, opening of her fine art photo exhibition. “Sights of Construction” series features desolate landscapes complemented by a majestic skylines.